Good news! I’ve just read Rockchip RK3188 Linux source code has just been released via Rikomagic, and Alok Sinha, the main maintainer of RK3066 source code, has already imported into github, and we should soon see a PicUntu image for RK3188 mini PCs. kernel Image:/home/jaufranc/edev/sandbox/rk3188/Linux3188/kernel.img for mid is ready. This kernel image is for Android only, and there’s a little work to modify it as a “pure” Linux kernel, so that it can be used to boot PicUnutu for RK3188. However, in arch/arm/mach, there are only board files for rk3188-box and rk3188-ds1006h. That’s great, i’m looking forward to a usable archlinux arm version. I guess this is due to their also being a dual-core. Which rk3118 device should I buy To get best community support ? For Android support, check out http://www.armtvtech.com/armtvtechforum/viewforum.php?f=206 or http://www.freaktab.com/forumdisplay.php?134-RK3188-Devices. It seems now Tronmsart T428 is the device with most activity. For Linux support, you may want to wait a bit, probably one of the device with Realtek Wi-Fi. How did you get the screen of the installer or what ever it’s called. I did this on my MK808 that has picuntu on it. I love it to run on the MK908 or RK3188 what they call it. Don’t get what to do now? I guess some how put it on the 16GB SD card I have to reboot to recovery? But if you just want to install Linux on RK3188, you don’t need to build it yourself unless you want to. Yet, this is still working in progress, and AFAIK a Pictuntu RK3188 image has not been released yet. You need to check the full log for errors. It’s possible one dependency is not installed. I have a Neo x7 and would like to compile a wheezy. Scroll up to find the error, or run “make”, not “make -jx” to see the error at the end. You would better use Minix SDK instead of the code here, as their kernel will exactly match their hardware. You should be able to use instructions adapted from to http://www.cnx-software.com/2014/01/27/getting-started-with-raxda-rock-how-to-generate-and-flash-ubuntu-saucy-server-and-desktop-images/ to run Debian Wheezy on Neo X7. Hi cnxsoft, thank you for the fast reply. Can I use the instructions for the raxda rock also for me neo x7? I’m not familiar with with kernel compiling and image construction. Do you know a good tutorial for building images for neo x7? So the build managed to complete…. Yes, the instructions for Radxa Rock and Neo X7 will be very similar because they both use RK3188, but you need to use the minix SDK (they’ve released it for the UI competition) to build the kernel (and boot.img), and the rest should be about the same. I needed to install libc6-i386 to get the 32-bit mkkrnlimg to work. Gave me the [kernel.img] error 127, before. I get this error at the end when I compile the kernel. Could you please update me. 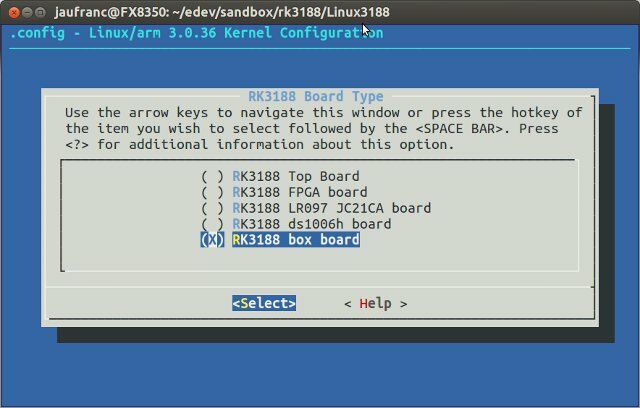 mkkrnimg cannot run… Are you building the kernel an x86/x86-64 machine or directly in a RK3188 development board ? The instructions above are for cross-compiling in a Linux PC.